One of the reasons why I try to make dishes belonging to cuisines other than Indian is to make sure that my kids get a taste of all types of food - be it Italian, Chinese or in today's case Moroccan. I really don't want my kids to be picky when it comes to food and would love them to have a good palette. I'am trying really hard and hope it will show some results when they grow up. I was introduced to couscous and lamb tagine by a bookclub buddy of mine. After seeing her cook a hearty and healthy couscous dish for us, I knew I wanted to try and make one myself. 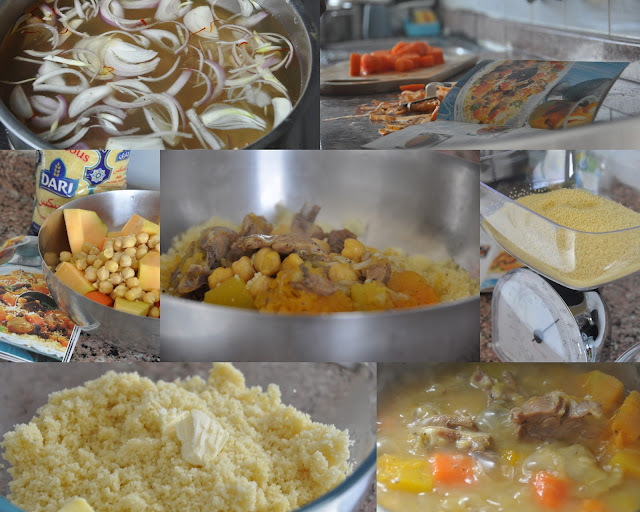 Following is the first ever couscous dish I made. And now it has become a household recipe. It's a really simple dish. You just have to put together few ingredients and then get back to whatever you were doing. A great dish for brunch or when having family or friends over for lunch or dinner. This recipe never fails to deliver! Place chickpeas in cold water. Remove skin with your fingers. Discard skin and drain. Place the lamb, onions, saffron, ginger, turmeric, pepper, salt and 1.2litres/5cups of water in a couscousier or a deep bottomed saucepan. Slowly bring to boil, then cover and simmer for about an hour, until the meat is tender. Stir the carrots, pumpkin and raisins into the meat mixture, cover and simmer for a further 30-35 minutes, until the vegetables and meat are completely tender. Prepare couscous according to the instructions on the packet. I usually use hot chicken/vegetable stock instead of salted water. Spoon on to a serving plate, making a well in the centre. Spoon the stew and gravy into the centre of the couscous, arranging some carrots down the sides, or alternatively stir the stew into the couscous. Pour extra gravy into a jug. Garnish with parsley or coriander with some chilli flakes and serve. this is an awsome recipe dear... loved ths... & posted it in ma blog too... ur place is awesome !! Adipoli.....I prepared a lamb tagine with couscos couple of weeks back....adipoli saadanam, isnt it?prep and ingredients are quite varied though! wow...will definitely try this.My family loves lamb.